Ann Veronica Janssens, Hot Pink Turquoise, 2019. 2 halogen lamps 750/1000 watt, dichroic filter, 1 tripod. Dimensions variable. 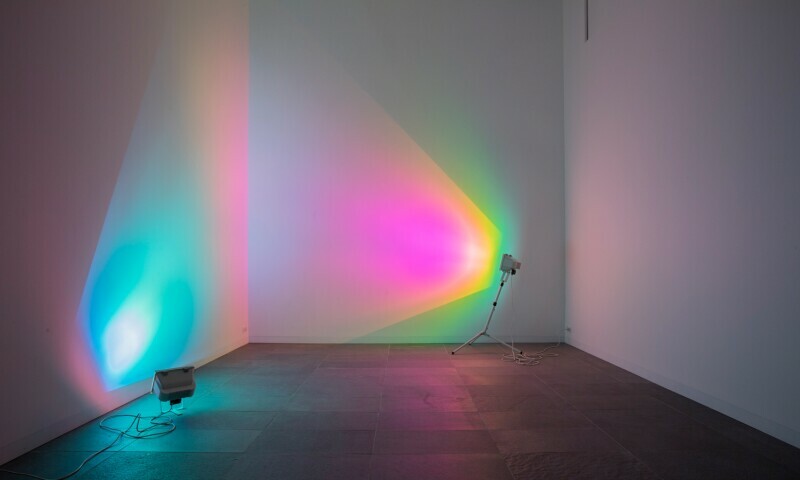 Through various media (installations, projections, immersive environments, urban interventions, sculptures), Ann Veronica Janssens invites the viewer to cross into a new sensory space on the borderline of dizziness and dazzlement. In a register inspired by cognitive processes (perception, sensation, memory, representation), her works tend towards minimalism, emphasising the fleeting, ephemeral and fragile nature of the environments she invites us to enter. The organisation of space and the diffusion of light, radiant colour, stroboscopic impulses, artificial mists and reflective or translucent surfaces all serve to reveal the instability of our perception of time and space. Properties of materials (gloss, lightness, transparency, fluidity) and physical phenomena (reflection, refraction, perspective, balance, waves) are rigorously examined here for their ability to destabilise the very concept of materiality.